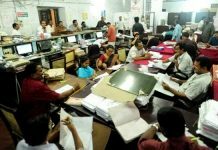 Siliguri, 20 June: POLITICAL parties in Darjeeling Hills have decided to boycott an all-party meeting convened by the state government in Siliguri on 22 June to end the on-going unrest in the Hills. They have also decided to continue with the indefinite shutdown in the Hills that is on since 15 June. The decisions have been taken today in a joint meeting of the political parties active in the Hills even as none of their frontline leaders were present. The meeting was convened by Gorkha Janmukti Morcha (GJM), which is leading a violent agitation against the state government since 8 June. In fact, while the meeting was on at Gymkhana Club in Darjeeling, GJM cadres vandalised two cars that were parked outside the Bhanu Bhavan in the town. The meeting resolved that not only political parties, no apolitical organisations from the Hills should also attend the state government convened meeting in Siliguri so to send out a signal that the Hills are united to achieve a separate Gorkhaland state. Parties who attended the meeting include, GJM, Gorkha National Liberation Front, All India Gorkha League, Jan Andolan Party, Communist Party of Revolutionary Marxists, Congress, and BJP. Two apolitical organisations ~ Darjeeling Dooars United Development Foundation, and Bharatiya Gorkha Parisangh were also present. This is the first time that AIGL and JAP have joined the meeting convened by GJM. They had skipped a similar meeting convened by GJM on 13 June. But none of the frontline leaders of these parties were present in the meeting today, and rather it was dominated by civil society members. While frontline GJM leaders are hiding for the past few days to evade arrest by police for inciting the recent violence in the Hills, top brass of the other parties were conspicuous by their absence. All through the meeting, a sizeable number of GJM youth and women cadres remained stationed outside Gymakhana Club demanding that the political parties should pledge for a united agitation for Gorkhaland. They were holding placards and chanted slogans to keep up the pressure on other parties. 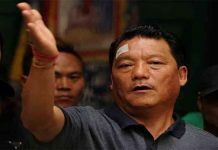 Sources said that similar to GNLF’s proposal in the 13 June meeting, JAP today suggested that GJM should immediately withdraw its representatives from all the elected bodies of the state government and dedicate itself for the Gorkhaland cause. JAP also suggested that the indefinite strike should be called off temporarily to give dialogue with the state and the Centre a chance. 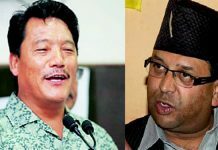 But both the proposals were turned down, but the parties decided to stay away from the election of semi-autonomous Gorkhaland Territorial Administration (GTA) whose current board is due to exhaust the five year term on 2 August. GJM is currently in chair at GTA. Addressing the Press after the closed-door meeting, a former civil servant P Arjun said that it had been decided to form an all India coordination committee to push for Gorkhaland and Tilak Chandra Roka had been selected coordinator for this. The committee would soon meet the Central government in Delhi and also raise awareness about Gorkhaland in all over India. Arjun said that the indefinite strike in Hills would be called off only when the state government withdrew the armed forces and resorted Internet service suspended since 18 June. This is despite that shortage of essential commodities has already hit the people in the Hills and the poor are facing extreme difficulty to make their two ends meet. The hill parties would meet again on 24 June to decide on further course of action.